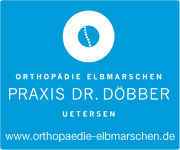 The orthopaedic private practice Dr. Döbber Hamburg is located opposite the S-Bahnhof Blankenese. You find us at the corner Blankeneser Landstraße / Süllforfer Kirchenweg at Gosslers Park Atrium. From there find the outside staircaise which leads to the entrance on the first floor. You may not want to use the outside staicase – there is an elevator at Blankeneser Landstraße next to the Budni delivery entrance. S-Bahn: take the train S1 or S11 to Blankenese (green line). By bus: take bus no. 1, 22, 36, 48, 189 or 286 to Bahnhof Blankenese. You will find parking places right behind the station (Parkhaus Blankenese). Address for navigation system: Sülldorfer Kirchenweg 2B, 22587 Hamburg.